Around 11.30 am, I made myself comfortable on a rock on the South Arm beach, ate some pre-packed lunch and enjoyed the glorious qualities of the day and the location. The view across the broad Derwent towards Blackmans Bay, Kingston, and Mount Wellington with a scribble of snow on its summit was sensational. South Arm beach stretched as a thinning arc and seemed impossibly long and pure. The photo below is the viewpoint directly in front of me as I ate my lunch. Glorious Mount Wellington on the western side of the Derwent River. Closer to the shore, a platform bobbed with the comings and goings of Pied Cormorants while they searched for their fish dinners. Meanwhile my feet hurt to walk on. I felt crippled. But I had two hours before the bus returned so, as with any days spent travelling overseas, time was not to be wasted simply sitting around. 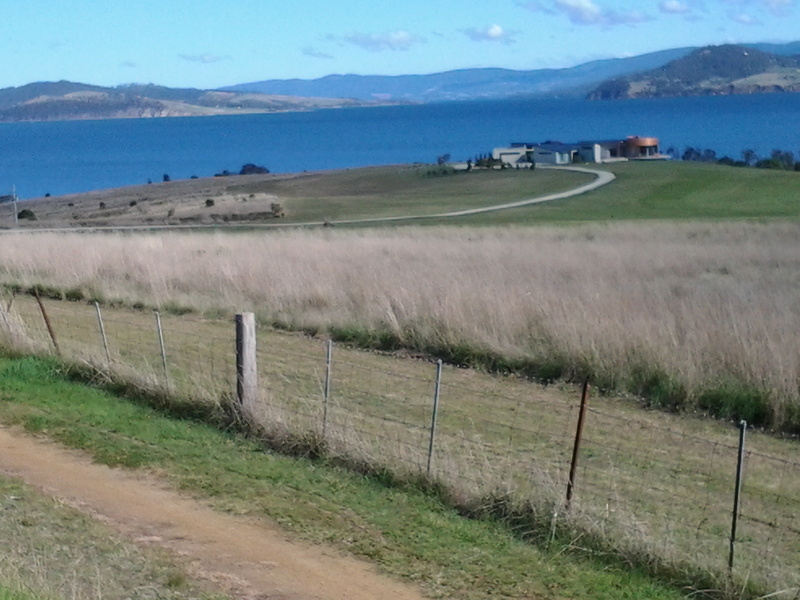 It wasn’t part of the plan for my first day walking the Derwent, however I decided to walk (shuffle if I must) the length of the South Arm beach, then take to the road and continue on towards Opossum Bay to find a bus stop. It took me 45 minutes to plod along the long South Arm beach. Apart from a few locals the beach was deserted, except for the Silver Gulls who entertained me with their happy feet. George Miller – forget those penguins! Here were normal ordinary seagulls performing a manoeuvre that left me astonished. As the short cold waves spread up the sandy beach, a seagull would stand knee deep waiting for the water to recede. When the water thinned, the gull would stamp both feet alternately on the wet sand at a super speed. Obviously this practice dislodged some wonderful edibles from the wet sand. With speed and agility, the gulls grabbed their lunch with a peck of their beaks. Then the speedy stomping began all over again. Very funny. Very clever. From the end of the beach it was clear there was no track around the headland and later, as I walked towards Opossum Bay, I saw a private house ‘owning’ the space – refer to the photo below. 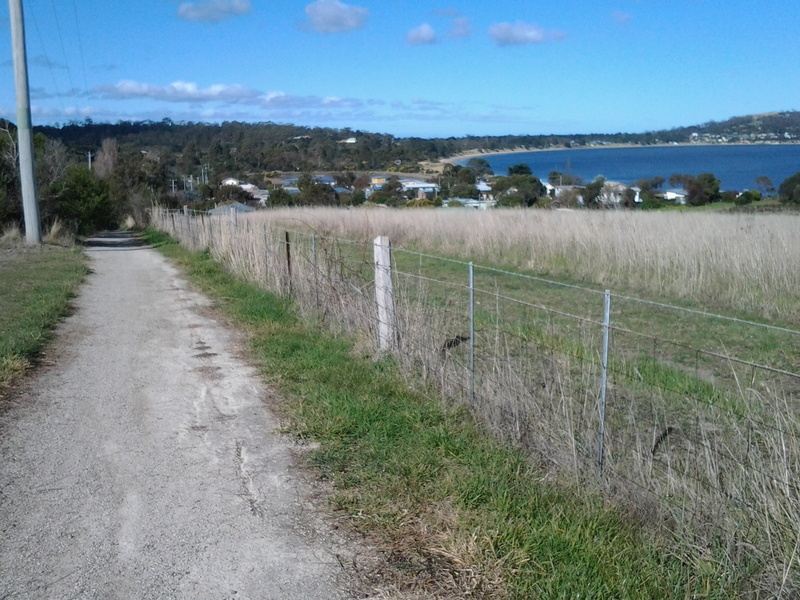 I used the gravel bicycle and walking track next to the main road which extended from the beach end of South Arm beach to Opossum Bay Store, with a bus stop opposite. This is where I finished my walk. During my walk from South Arm to Opossum Bay I looked back at the long stretch of South Arm Beach. Fort Hill is above the township to the upper right. The photo below gives some idea of the beauty of the place, and I hope it inspires others to take the walk. This last leg took about 45 minutes. On route to the store, I passed two tourist information stands, both of which referred to this roadway being part of a convict trail, something which a team of local residents have researched (http://www.abc.net.au/news/2013-12-22/a-trail-between-south-arm-and-opossum-bay-tells-tales-of-tasman/5171434). The information which I found most interesting was that approximately 70,000 people came to Hobart on the prison and other ships between 1804 and 1853. I reflected that, of course, they all had to pass by Cape Direction, Cape Deliverance, Johns Point and the beaches on which I had been walking. It’s impossible to imagine how foreign this land of ours would have looked. And to think I started the day with trepidation! Celebrity spotting: Brian Ritchie, once of Violent Femmes and now of MONA fame, filling up his car with fuel at the Opossum Bay store. Well I think it was him. If you follow my walk and are in need, the public toilets are located 100 metres further along from the Opossum Bay Shop toward Opossum Bay beach. Outside the Opossum Bay store are tables and benches, so I took the opportunity to finish my lunch. Sitting nibbling and watching people come and go occupied me until it was time to catch the bus. 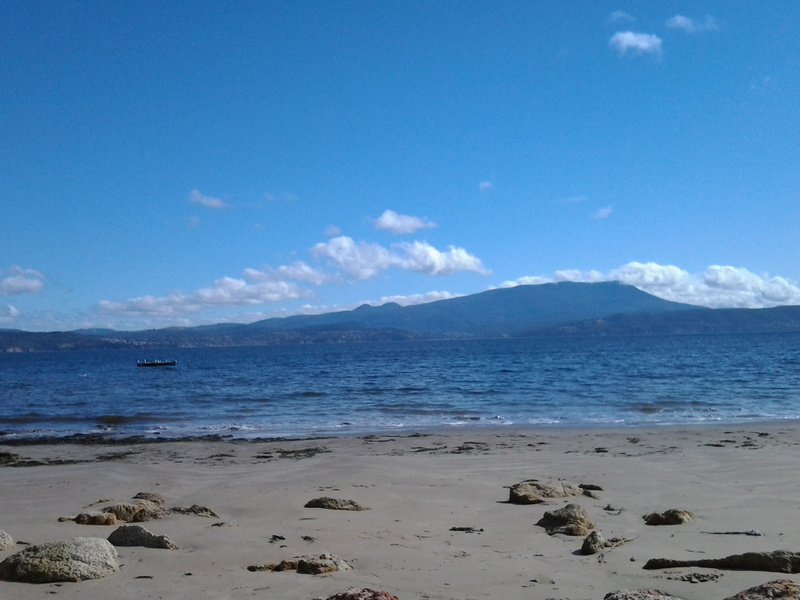 This entry was posted in Derwent River, Mount Wellington and tagged Blackmans Bay, Brian Ritchie, Cape Deliverance, Cape Direction, Derwent River, Fort Hill, George Miller, Johns Point, Kingston, Mount Wellington, Opossum Bay, Pied Cormorants, South Arm Beach, Stage 1 on August 23, 2014 by Tasmanian traveller.